Joni Young stands behind the counter at the new University Bookstore, located in the Meadows Gallery at the Chan Shun Centennial Library until September 6. Southwestern offers two options to students looking to get textbooks for classes: online at swau.textbooktech.com or at the temporary bookstore in the Meadows Gallery at the Library. 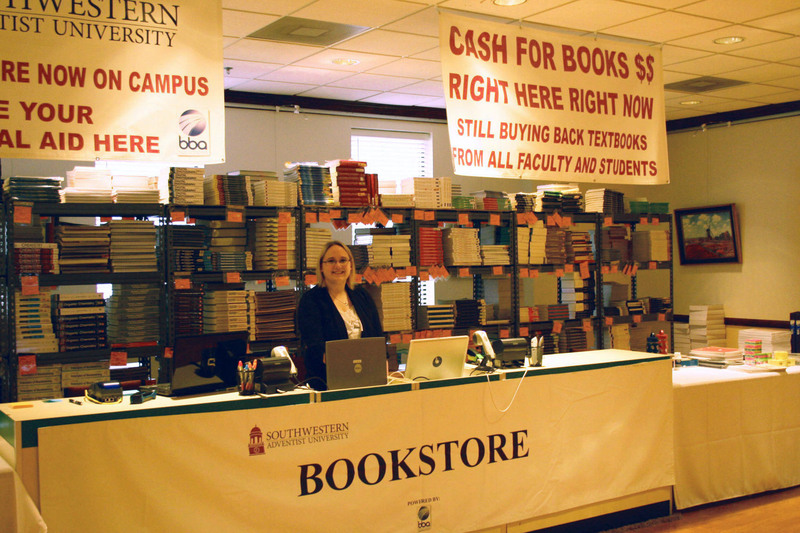 The bookstore in the Meadows Gallery opened Aug. 21 and will run through Sept. 6. Students must take their class schedules with them to the Meadows Gallery to get books. A link for the online bookstore is sent to students’ emails once they are completely registered. Once a student clicks on the link, he or she will be directed to the site where they must create an account, click on the tab Textbooks once finished, enter all course information, add books they need to the cart and proceed to check out with a credit card/debit card or financial aid. According to Jerry Potter, associate student accounts director, every student will be advanced $650.00 for book credit unless a student checked the box that he or she did not wish to charge books to his or her account during registration.